Thursday Thoughts, and a finish I can show! 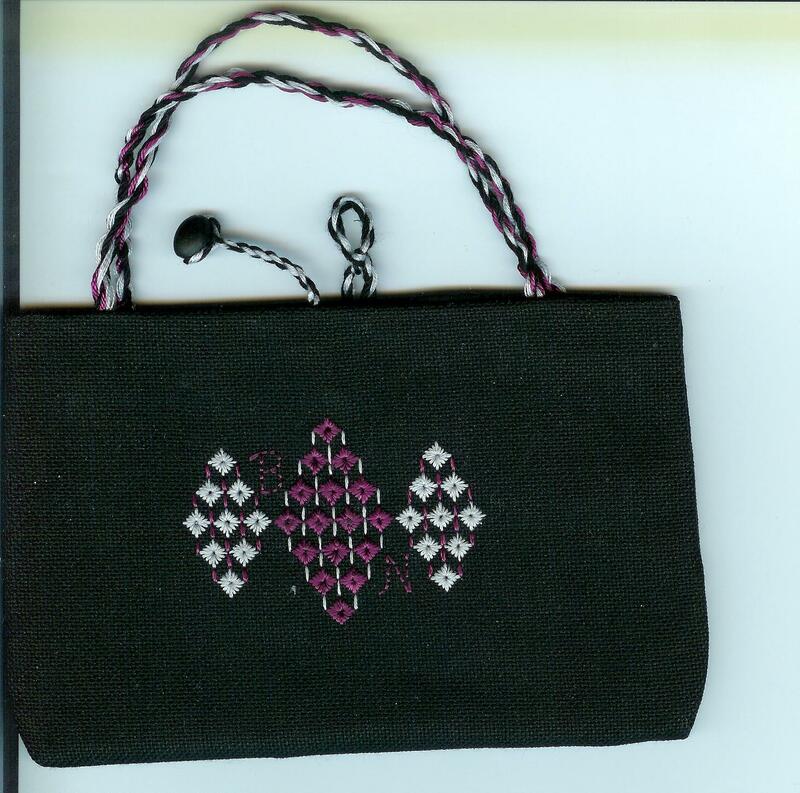 I decided to finish this black cherry argyle into an evening bag for a good friend. I personalized it with her initials, and I hope she’ll like it. As I was stitching it, I just had the strongest impression of HER on that fabric. And this morning, I knew that I finally had to finish it and send it to her. I was dreading placing this on Etsy. I hated the idea of something that felt like BELONGED to someone else going up for sale. So I decided to listen to what my heart was telling me. This is different from the other 2 little evening bags I’ve finished. Instead of a one-piece handle through grommets, this is a two-piece handle, finished inside the top seams. Plus, I figured out how to make a twisted-cord bead toggle for a clasp. I just need to fray-check the heck out of the loop, so that it will hold up. So the idea of “listening to my heart” brings me to my Thursday Thought. This friend and I met through Aloette, on a random phone call that was basically a wrong number. Over the course of the last 3 years we have gone from colleages and team members to true friends. I value her opinion and her wisdom, and she has done everything she can to encourage my creative spirit. I remember about a year ago, when another Aloette colleage started sending out messages about “What makes your heart sing?” That was when I started thinking about finding away to express myself, to stop treating cross stitch and embroidery as just a hobby. I know many of you know how this feels, you’ve blogged about it yourselves – the peace you feel, the release, the focus when you are in a project. And also the distraction, even despair, when a project isn’t going well. I decided then that I needed to search for a way to let my heart sing, and since then I’ve discovered that, for me, it is stitching with a purpose. Whether it is a gift for family members or a RR piece, if it’s destined for someone else, I try to stitch with that person in mind, to make each stitch with love. To Beth, I don’t know if you read this often, but I hope you like your gift! It’s coming your way this weekend. Thank you for 3 years of encouragement (it seems like I’ve known you much longer! ), I’ve tried to tell you how much you mean to me, but there really aren’t words. That is so pretty, I’m sure your friend will be absolutely thrilled to receive such a wonderful gift! Very pretty! I’m sure she will love it!